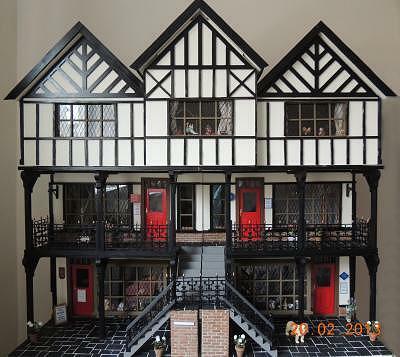 Following Margaret’s Georgian dollshouse, then her Tudor dollshouse, she has created this amazing collection of shops in one big house. 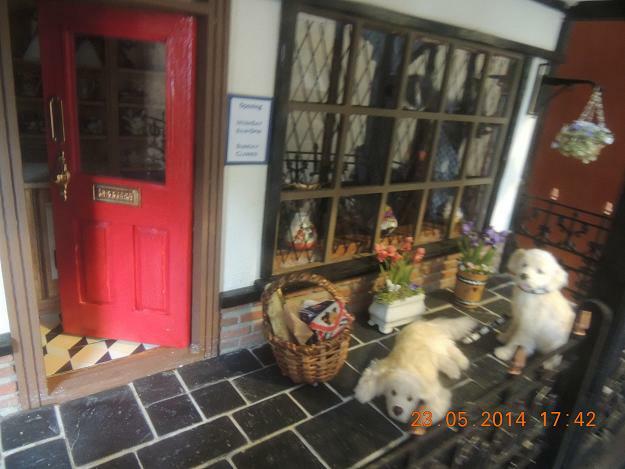 She said: “The new house is the Chester shops from the Dolls House Builder. I was born near Chester and used to frequently shop on the Chester “Rows” before I moved to South Wales. As you can imagine, I could not resist this house. It was my winter project during 2012/13, but I went at it as though my life depended upon it! 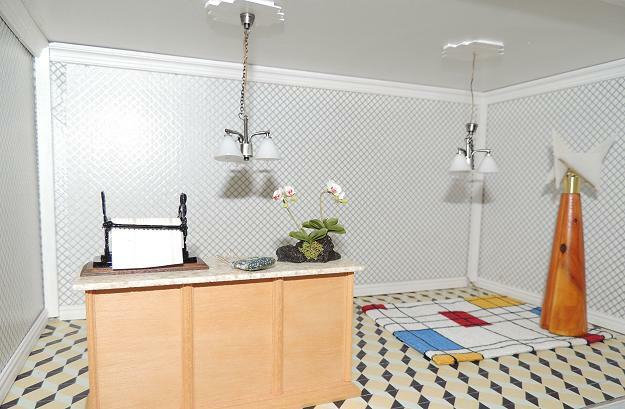 Arts & Crafts – I did a “Karen carpet” for this room. 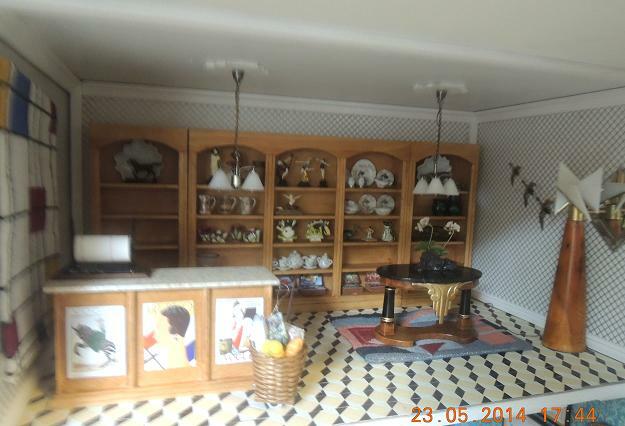 I am doing this room as an Arts & Crafts furniture and accessories shop. The dresser at the back of this furniture shop was based on a Liberty design. Art Nouveau Tea room – I did the Art Nouveau “Josie” carpet for this room, and plan to also use the “Art Nouveau Tulip” bellpull too. 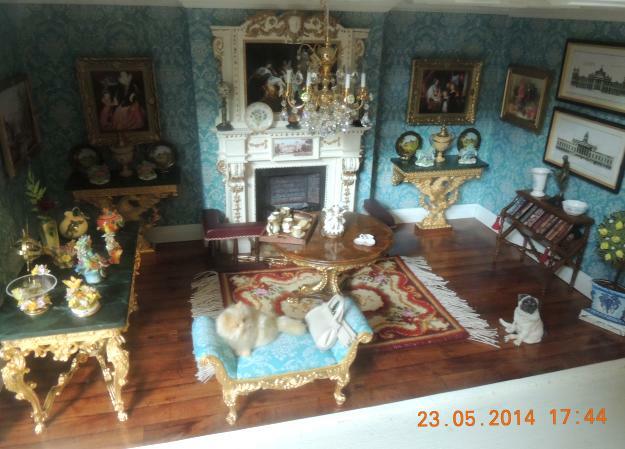 In the Fine Art shop (French type gilt furniture, ornaments, and paintings) I have used the “Sarah” carpet. Art Deco Modern China shop. I actually made up the carpet in an Art Deco style myself. This room is the least advanced so far – I have done it quite plainly in white/silver wallpaper, and I am going to have a wall of shelving at the back for Art Deco and more modern ornaments, etc, eventually. 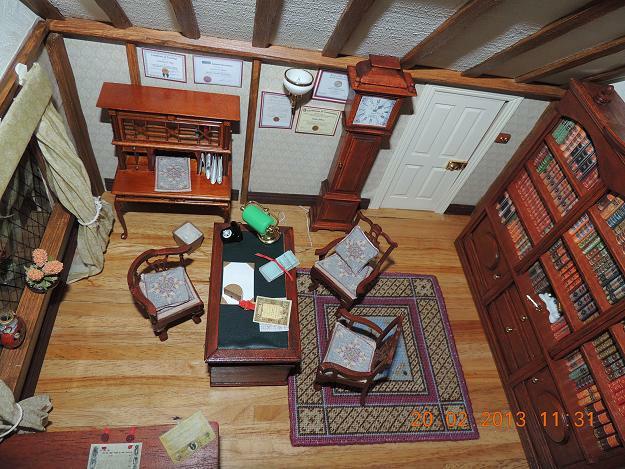 Seamstress Room – I used the “Prudence” Carpet and cushion and I thought these a lovely design. I also did the “Crinoline lady” tray cloth. I wish there was a matching footstool! Solicitors Office – I did the “Isobel” carpet for this one. I really enjoyed sewing this carpet, and adapted the design myself to make chair covers, cushions and a tea tray cloth to match. 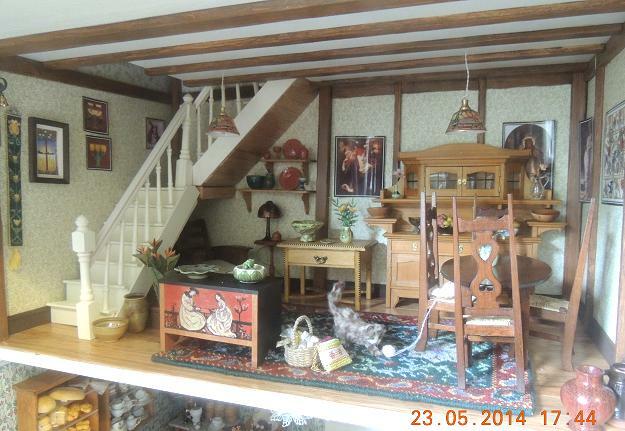 Margaret has sent her latest batch of update photos of her ‘Chester Rows’ dollhouse shops mini building. 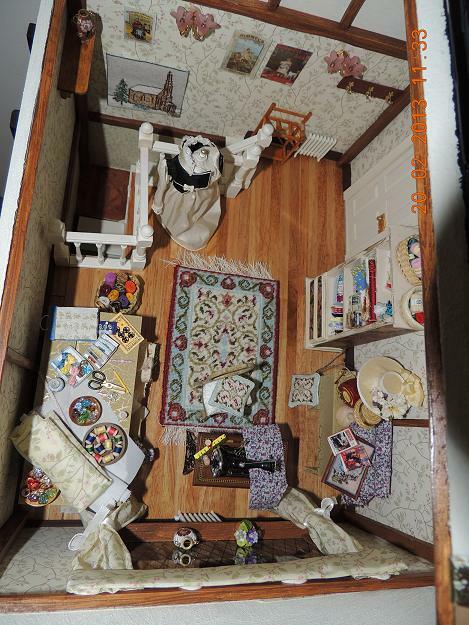 Her interiors are always packed with detail! 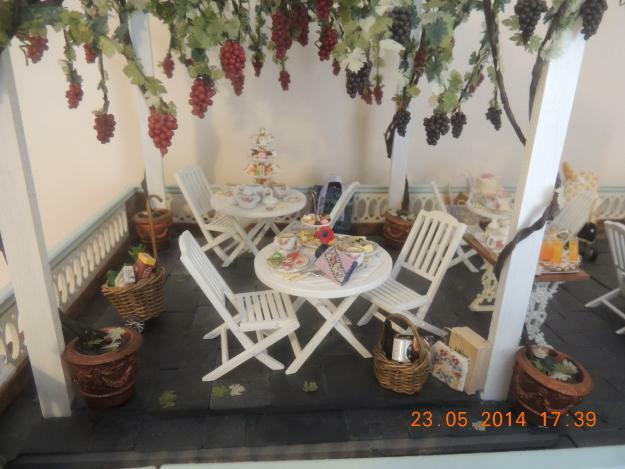 This is the gazebo on the rooftop of the Tea Room. Isn’t the grapevine wonderful? You can see the “Diagonal Stripe” clutch bag in the centre of the picture, and a “Delicate Flowers” handbag near the base of the pillar on the right. 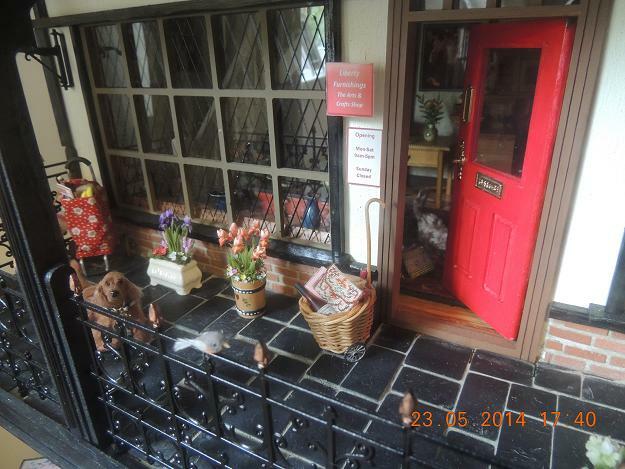 This view shows the Chester Rows shops from the “Rows” outside – a “Peony” clutch bag is perched on top of the shopping basket outside the doorway to the shop. A “Deco Posy” clutch bag can be seen in the shopping basket to the right of the shop doorway. 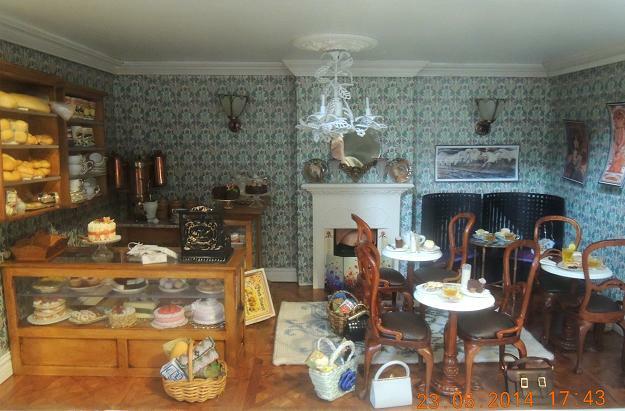 Inside the gorgeous Tea Room, the tables and chairs are set out on a “Josie (blue)” Art Nouveau carpet, and there is another clutch bag in a basket in front of the counter – this time, it is a “Bargello (pink)” one. 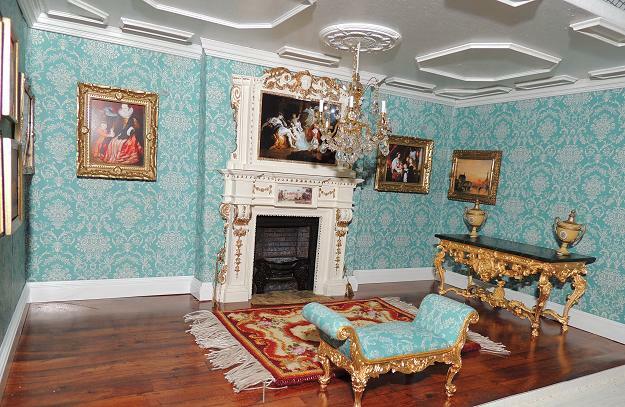 This ornate room is set off by the “Sarah” carpet in the centre of the room. I just love the fluffy cat on the sofa! This Arts and Crafts room has the William Morris-inspired “Karen” carpet as a focal point. 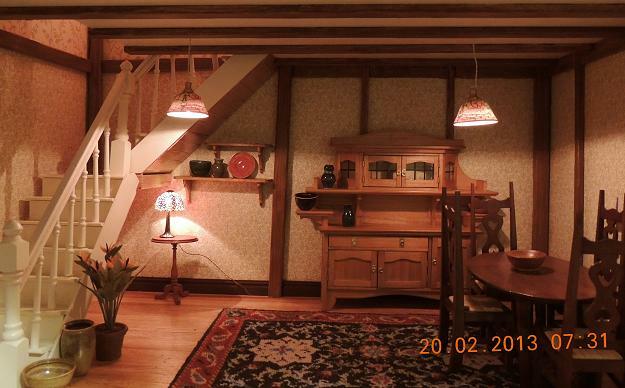 There is also an “Art Nouveau Tulip” bellpull at the base of the staircase. This stunningly different Art Deco shop has an “Alma (grey)” carpet in the centre, surrounded by stylish china pieces and other artwork. The shopping basket in this room has a “Jazz Age” handbag (what else?!) tucked inside it.